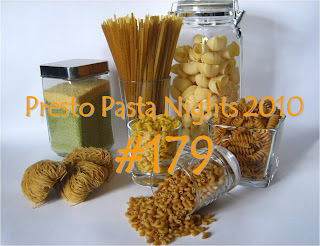 Presto Pasta Night #179 is finally ready and filled with a fantastic lineup of glorious dishes... but you've waited long enough...so make up your own mind as to which one to try first. Thanks all for an awesome selection. First in this week...is Priya of Mharo Rajasthan's Recipes with a perfect marriage of East & West. It's a Curried Pasta that she "borrowed" from another wonderful blogger - Aparna & her Diverse Kitchen. I love it when dishes get "played forward" with a little personal tweeking. Anu of Truth Personified (and a very interesting blog) also shared another friend's dish - Sali of VeggieBelly's Spaghetti with Spinach Balls that looks wonderful. Katerina of Culinary Flavors made her version of that wonderful Greek classic - Pastitsio and it sounds perfect. Daphne of More Than Words always brings something wonderful to our PPN table and this time is no exception. 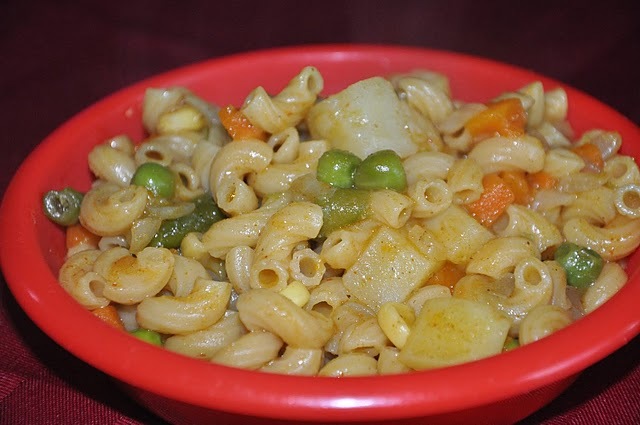 I'm drooling over her Tom Yam Seafood Pasta Stir Fry! Joanna of Eats Well With Others...not only cooks up great dishes, she tells terrific stories and takes awesome photos. Tell me you don't absolutely adore her Puerto Rican Pastelon or Plantain Lasagna, even if it doesn't have any noodles. Tigerfish of Teczcape came up with a perfect -"beat the heat" (and at over 40 degrees C here in Nova Scotia, I am needy) Summer Noodles in Sesame Tahini Sauce. 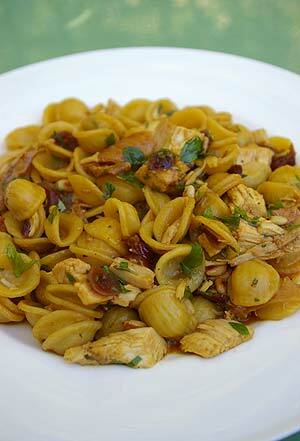 Claudia of Honey From a Rock whipped up a perfect cold Grilled Ahi Tortelli Pasta Salad to help beat the heat. It looks wonderful. 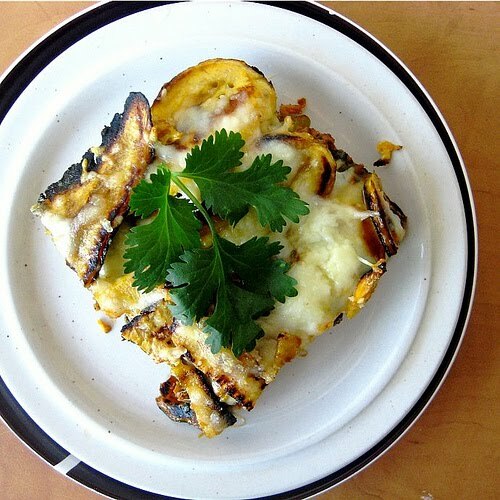 Abby of Eat the Right Stuff made a fantastic dish. She, like my Honey doesn't really enjoy a roast chicken dinner, but this is one even he will lick the plate clean...Roast Chicken Pasta. Jennifer at Cook, Eat, Play, Repeat (don't you love the name of her blog?) made a very tasty version of Penne Carbonara. 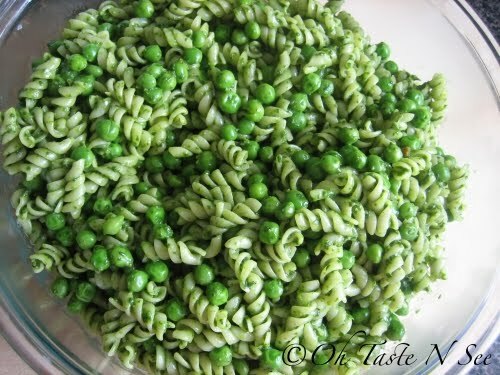 Denise of Oh Taste n See made this perfect Pesto Pasta & Peas - so green from all that spinach and peas. Susan the Well Seasoned Cook outdid herself and she shared the zen-like holiday mood as well. 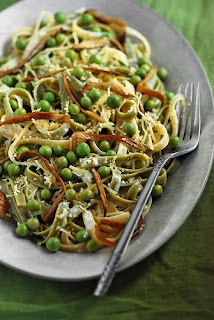 Check out this delightful Paglia e Fieno - Straw & Hay Pasta with Porcini & Peas...the name itself just sings. 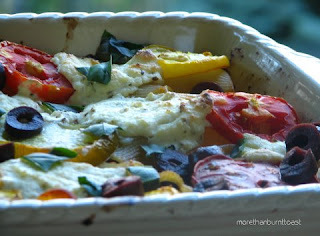 Val of More Than Burnt Toast and one of my favorite food bloggers wrote an awesome post celebrating one Canadian Chef and a perfect Heirloom Tomato Pasta Bake. I'll be whipping it up as soon as the weather cools down, that is. Please let me know if you want to have some fun and take over the Presto Pasta Night Hosting reins for a week. October and beyond are wide open. My mouth is watering! So many great dishes this week! 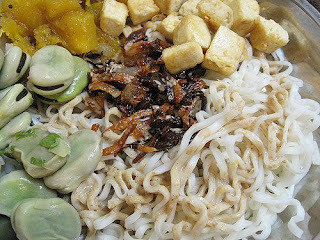 I'm also extremely happy that it's starting to cool down here, since I've been wanting to cook more! I chose to read this during lunch time so that I can "eat"! :D ...heartily. This lineup of great dishes would keep us going for a month of Sundays. Gorgeous round up and such great use of summer's veggies all around! Love it. Wonderful recipes and great pictures! Can't wait to check them out more, thanks! Thanks very much, Ruth, for another great pasta pot luck. I always enjoy scrolling down the menu to get my fill.